This section of the DCAU Resource is dedicated to the New Frontier Direct to Video Movie. The New Frontier takes viewers on an action-packed adventure, exploring the origins of the Justice League. 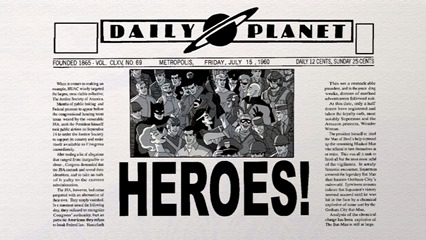 DC Comics legends Superman, Batman and Wonder Woman are all featured in the film as well as Green Lantern, Martian Manhunter and The Flash - as they band together to form the legendary super team. Strangers at first, these very different heroes must overcome fear and suspicion to forge an alliance against a monster so formidable, even the mighty Superman cannot stop it alone. If they fail, the entire planet will be "cleansed" of humanity. Also look for up and coming information on the newest DC Animated Universe series, the Legion of Superheroes. It is slated to continue later this year on Kids WB!. Be sure to check out Series News for up to the minute Legion news. DCAUResource.com is an unofficial website. Batman, Flash, Green Lantern, Martian Manhunter, Wonder Woman, Justice League and all other related characters and indicia are copyright DC Comics, a division of Time Warner.